Adding animated vehicles inside your animated scene is time consuming. And you can imagine how difficult add entire street traffic in your scene. Imagine if there is a plugin that can do it automatically for you. Yes there is a new plug in named Real Traffic (for Cinema 4d), which can create real life like traffic with simple set up. 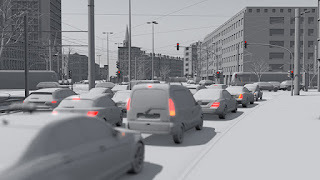 You will get completely rigged vehicles which obey traffic based on the computed intelligence. It will obey the traffic signals, stop vehicles if something crosses there way, and steer the wheel based on the twist and turns. Sounds amazing. Watch the demo video. You can get a 30 day demo plugin, although it is limited to some extend. In the first release, RealTraffic provides four different types of vehicles (cars, trucks, buses and trams), which can be freely configured in size and number of axles. Additionally, any number of trailers can be added so that it is possible to easily create semi-trailers, trucks with trailers, articulated buses or multi-carriage trams. Using the free Car Rig Helper and the automatic setup function there are just a few mouse clicks from downloading the car model to the final RealTraffic -vehicle. RealTraffic can handle the traffic without collision by just using the priority ranking of crossing lanes. In addition, the nodes can act as a stop sign or traffic light. The traffic lights are controlled by special objects being able to manage any number of light signals. Thanks a lot for sharing this helpful tutorial with us. Check out some of the nice designs about Dance school Logos I have curated.